Virtual therapy: Could you open your heart to a video screen? Promotional materials for Live Health Online Psychology, a service that allows patients to “see” a therapist using video conferencing. Photo courtesy of Aetna and Live Health Online. Therapy is an intimate process marked by a need for trust, honesty and deep revelations. Given its very nature, it seems like a field of medicine that has to be done in person, with patient and doctor in the same room, able to read each other’s body language and subtle emotional cues. But that may no longer be the case. A growing number of services are offering telemental health, in which patients can “see” a therapist via video conferencing on their phone or another device. Proponents say it could fill critical gaps in mental health care, while others caution that there’s no substitute for seeing a mental health professional in person. However, even Deitz admits that not everyone has that option. According to the American Telemedicine Association, there are 4,374 mental health professional shortage areas throughout the country. The U.S. Health Resources and Services Administration defines a mental health shortage area as one in which there’s only one psychiatrist for every 30,000 people. With about 18.5 percent of Americans suffering from a mental illness, that’s a lot of people who go untreated, says Jennifer Gentile, director of behavior health for American Well, a Boston-based telehealth company that provides remote access to mental health services throughout the country. American Well has teamed with multiple insurance companies to offer virtual therapy as a covered benefit. These include United Health, as well as Anthem Blue Cross Blue Shield, which offers telemental health through its app LiveHealth Online. 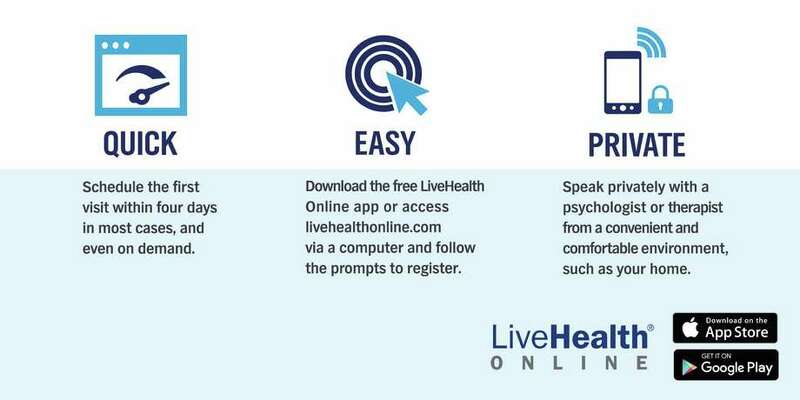 LiveHealth Online Psychology was made available for Connecticut customers in January, and is available to the majority of Anthem customers, including those who enrolled for coverage through the state’s health exchange. There’s also an adolescent psychology service for children 10 to 17. Clients who want to use the service just call a number on the back of their insurance card, and they can make an appointment. At the day and time of that appointment, they click on a link sent to them through LiveHealth Online, and are connected with a therapist. Gentile says customers can use the therapy service to get help for everything from substance abuse to anxiety to postpartum depression. “It’s not good for a new patient who says ‘I want to hurt myself or hurt other people,’ ” she says. Also, its therapists — the majority of whom are social workers and psychologists — can’t prescribe medication. Patients who need anti-depressants or similar drugs will need to get them through a regular physician (or through LiveHealth Online’s virtual doctor service, provided the drug isn’t a controlled substance). American Well isn’t the only provider of therapy via remote. Others include Breakthrough, a mental health service of the Florida-based telehealth provider MDLive, and an independent site called eCounseling. Prices vary depending on the provider, as does insurance coverage.